Keshet cultivates personal growth and technical excellence by mentoring, challenging and empowering students through the experience of dance in an inclusive and nurturing environment. 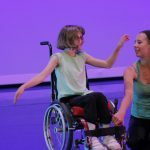 Keshet Dance offers community classes for kids (starting at age 2), teens and adults including Contemporary, Ballet, Jazz, Hip Hop, Creative Movement, Mixed Ability/ Adaptive Dance and Fine Wine Dance (Moving FWD for ages 55+). Registration for Classes is OPEN and ongoing! Create an account with the dancer’s name – not the parent’s name. Create a separate account for each dancer. If you are interested in applying for a youth scholarship you must do it in person or on the phone. Keshet’s Fine Wine Dance (Moving FWD) class brings together individuals ages 55+ to explore movement and choreography as a community within an engaging and exciting workshop series. 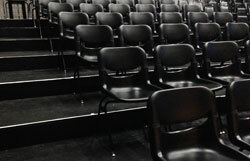 Participants in each session will have the opportunity to perform their creative work. SPECIAL DISCOUNT: 50% discount on classes for dancers 55+ *not available with online registration – please call 505.224.9808 or register prior to class. Keshet’s goal is to ensure that everyone, no matter what ability level or financial status, has the opportunity to dance. Therefore, Keshet offers unlimited, noncompetitive scholarships to youth under 18 participating in the community class program. No one will be turned away and registration is ongoing. Class registrations and youth scholarship applications are accepted throughout each session. Families are asked to “pay as they are able” and then show support for their children’s classes by fulfilling a small volunteer commitment. During Keshet’s most recently completed fiscal year, over $70,000 in financial aid was awarded to dancers of all ages. Scholarship applications must accompany a completed class registration form. A scholarship application forms can be completed in person 15 min. prior to the start of class time. Keshet is looking for motivated and enthusiastic people to join our support team! Keshet’s Work/Study Program is an exchange of hours worked for hours of dance class on a 1:1 ratio. Therefore, for every hour worked, participants are eligible for one hour of dance instruction within Keshet’s Community Class Schedule. The WorkStudy Program has rolling enrollment, if you wish to dance in consecutive sessions, you are required to sign a new agreement with updated availability and class registration at the beginning of EACH session. Applicants must be 18 or older to apply and must participate in an interview and orientation/ training prior to acceptance into the program. No dance experience is necessary. Call, stop by or click on the link below for more information. Mixed Ability is a way of teaching in which participants of different abilities are taught together in the same class. Other terminology is integrated dance, inclusive dance, adaptive dance. 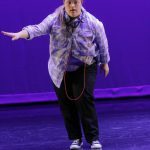 Keshet’s teaching faculty conducts dance classes and workshops for youth and adults with varying levels of physical and developmental abilities to create professional-quality dance works in a mixed abilities environment. As a result, dancers and audience members share in the idea of unlimited possibilities through the experience of dance. 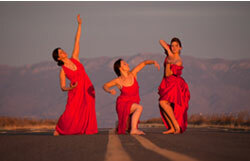 Dancers of all abilities, call 505.224.9808 or email Silva@KeshetArts.org today to find the right class for you! 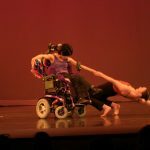 Did you know Keshet Dance offers the FIRST national, pre-professional dance training program for dancers with disabilities? Since its inception in 1996, Keshet’s talented teaching faculty has been connecting community members with dance in an effort to build a stronger community. Programming includes workshops, classes, and performances in libraries, youth shelters, detention centers, schools and community centers throughout New Mexico. Participants in Keshet’s Community Engagement gain self-confidence and self-discipline by challenging themselves to use their bodies in new ways and by working together with instructors and other participants. The Title 1 Homeless Project is an after-school program that provides academic tutoring and a hot meal to homeless children in Albuquerque. As part of the program, Keshet’s outreach facilitators teach 8-10 classes per week at elementary, middle and high schools throughout the city, reaching approximately 250 homeless youth annually. 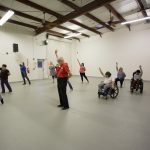 Keshet faculty teach a weekly creative movement class at Keshet Center for the Arts for partners who provide assistance to adults with disabilities.